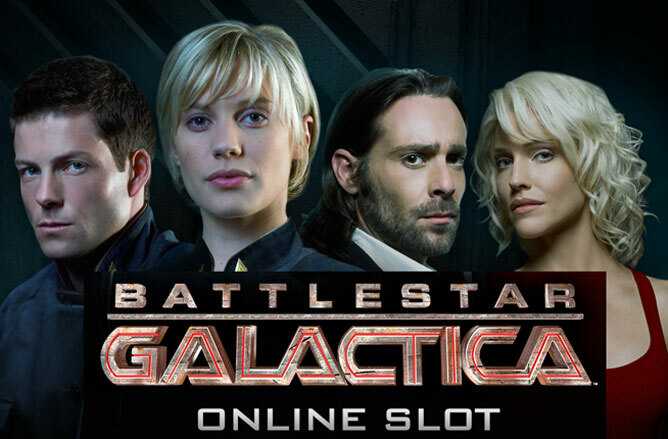 The new slot game released by Microgaming is Battlestar Galactica and it is based on the acclaimed television series with the same name. The Battlestar Galactica Slot game was released at all top online casinos which use Microgaming software in December 2012. The Battlestar Galactica Slot game has five reels populated with characters from the TV show and a 243 ways to win payline structure. The slot game is also filled with bonus features and three different playing modes. There are two main bonus symbols in the Battlestar Galactica Slot game. Wild Symbol – The Wild Symbol is the Battlestar Galactica logo and this symbol will help create winning combinations by substituting non bonus symbols on the reels. Wild symbols usually give additional opportunities to win and in Battlestar game they also execute this function. Scatter Symbol – The Scatter Symbol is the Spaceship and players that get three or more of these symbols scattered across the reels will unlock the free spins bonus. Free Spins Bonus – The Free Spins Bonus consists of 15 free spins and a multiplier of x3 on every win. You do not need to pay for this spins, they will all be of amount of the bet which has led you to the hitting of this bonus. It is easy to enjoy all the benefits of this game, as all of the symbols appear at the screen all the time! If you are not sure that you are ready to play game for money and just want to clarify how the symbols act in game, just play this game in demo mode! There are three play modes in the Battlestar Galactica Slot game and these are randomly triggered by players will mainly play in the base game mode. 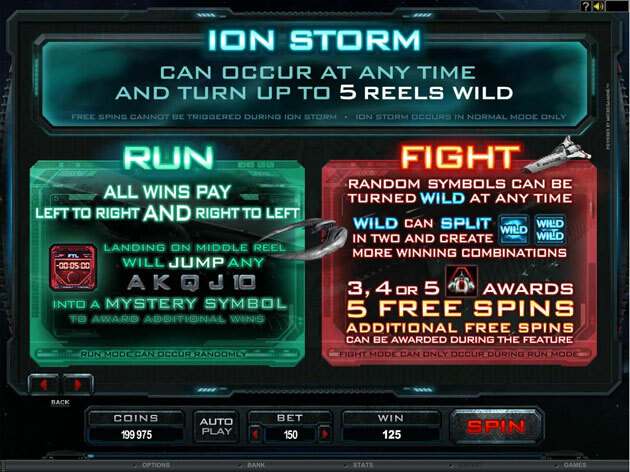 RUN mode – During RUN mode the wins will be paid from left to right and right to left, doubling the chances of creating wins. There is also a bonus feature that takes place when the FTL symbol lands on the third reel. All royal symbols will disappear and be replaced by a new wild symbol. FIGHT mode - During FIGHT mode random symbols can become wild at any time, this is called FIGHT mode as the Cylons and Colonials will be battling it out across the reels. As an extra bonus feature the wild symbols can also split to create a double wild. Three or more scatters can also launch the free spins bonus but players will only get five free spins. Players can also unlock video footage and bonus features by working their way from Civilian up to Admiral, eight ranks in total. In order to move up a rank players will need to spin as much as possible, but it will be worth it when all is unlocked.